CyberGhost is a serious contender in the world of VPN providers. It boasts a vast range of handy features that are not so often found in its competitors and it provides great security and speeds and smooth performance. Moreover, the VPN client is rather easy to use. Basically, as you will see in our CyberGhost review, there’s almost nothing not to like about CyberGhost. Even first-time VPN users will quickly understand how to use CyberGhost and what it can offer its customers. Installing the client is simple and doesn’t take more than a few minutes. When you open the client, you first have to choose the purpose of using a VPN, including torrenting, wi-fi protection, anonymous surfing, etc. You can also select their custom setting where you will find the menu with options to log in, activate a new key or upgrade your current account. You can choose a region and IP address to connect to. There are advanced settings too. CyberGhost has more than 2770 servers in 60 different countries of the world. Some more popular countries have multiple servers. For example, the United States has as many as 462 servers, the UK hosts 340 servers, and there are 109 servers in the Netherlands. All users can choose to connect to whatever server they like, in any location they want, with unlimited data. This gives them plenty of flexibility, especially while traveling. Like with most VPNs, your speed will suffer a bit. However, this has nothing to do with CyberGhost. It is completely normal to experience somewhat slower speeds while using a VPN than when accessing the Internet without one. That being said, we noticed only slight diminishment in speed during our tests and we had no problem streaming HD video content, without any annoying glitches. CyberGhost is also pretty reliable and rarely disconnects. You will also be happy to know that it provides an Internet kill switch that shuts off all your Internet traffic in case something unexpected happens. CyberGhost supports all major operating systems, including Windows, OSX, Linux, Android, and iOS, which is pretty much the norm in the VPN game nowadays. However, the service also offers free proxy plugins for Chrome and Firefox, allowing users worldwide to easily encrypt their browser traffic. This is rather praiseworthy, particularly since the plugins are available even in countries with Internet censorship, such as Turkey, the UAE, and Iran. Keeping in mind that even the most popular VPN services usually allow up to 3 simultaneous connections, we are quite impressed by the fact that CyberGhost can be used on as many as 5 devices at the same time with a single account. CyberGhost uses OpenVPN, which is considered by many to be the most secure protocol in this moment. In addition, you can also opt for PPTP, which is pretty fast but not as secure as OpenVPN, and there is also L2TP with IPsec. This is a very good choice of protocols and prospective users will be happy to learn that switching between them is relatively easy and quick, which means you don’t have to commit yourself to just one protocol. The company uses military-grade 256-bit AES encryption, which is currently the strongest on the market. Torrent users might be happy to hear that the service is P2P-friendly and even offers a special user profile designed to allow you to torrent anonymously. CyberGhost offers another interesting feature and that is the possibility to pick and set preferred Wi-Fi connections and add them to your protected list. 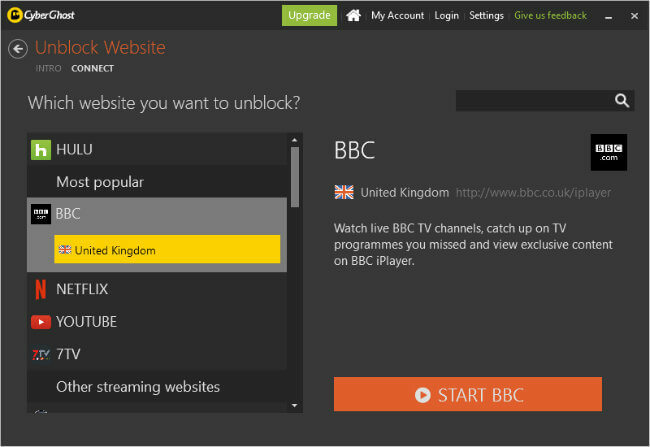 Once you do this, every time you connect to them, they will automatically run through the VPN and you will be secure. The CyberGhost client gives you instant feedback regarding your IP address (the assigned one), server location, malware, ads and online tracking. This gives you a lot of control over what is going on with your connection and it is also very convenient because all this information is stored in one place, easily accessible with just one click. This provider offers some extra features that are rarely seen in other VPN services. This includes an ad-blocker, anti-tracking, malware blocker, DNS leak protection, IP sharing, hidden IP and IPv6 leak protection. All packages include unlimited bandwidth and an antifingerprinting system. The service offers free custom clients for Windows and Mac, and mobile apps for iPhone, iPad, and Android mobile devices. CyberGhost uses the 256-bit AES encryption over OpenVPN and as mentioned previously in this CyberGhost review, L2TP with IPsec and PPTP are available. However, the setup process for those two is somewhat complex for new users. The good thing is that the setup is perfectly explained in the knowledge base if you are willing to take the time to read the instructions. In case you have any trouble installing the client or can’t find the information you need, you have the option to contact customer support via a support ticket. They also have live chat, but it is only available during eastern European working hours. Most VPN providers offer 24/7 customer support, so this is definitely a drawback. On the other hand, the customer service reps we have talked to while researching for this CyberGhost review have been friendly, helpful, and knowledgeable. CyberGhost also offers an extensive knowledge base that contains the answers to the most common questions, as well as various manuals. Another negative is that there is no peer support as CyberGhost decided to close down its forum at the end of 2014. CyberGhost currently accepts all major credit/debit cards, PayPal, and Bitcoin, which is excellent news if you want to remain completely anonymous while purchasing your chosen subscription. At the end of this CyberGhost review, here’s a quick overview of the features that wowed us and the aspects of the service that could use some improvement. Our ratings are the result of an objective and independent evaluation of CyberGhost, generating the final rating that reflects the overall quality of the company. Ratings may change as the service changes. CyberGhost user rating based on 17 user reviews. Tried cyberghost for a week, however, they didn't support what I needed them for (site-to-site) even after they said they could over chat. Cancelled the service and thought that was that. 6 months later they started charging my card again, however, my username and password don't work since the account was cancelled and their support isn't very helpful. I’ve always liked CyberGhost but have to say that I’m pretty disappointed with how it’s handling the Netflix thing. For a while now I haven’t been able to stream without glitches, errors, and a whole lot of problems. Sometimes it works, sometimes it doesn’t, I just can’t rely on it (Netflix-wise). I like the VPN but I don’t like the customer service. They act all friendly but treat me like I’m stupid or something and I have to ask 5 times to get a straight answer. Should be no.1 on the list, better than others by a mile. I tried Cyberghost pro for a month. I cancelled, but they keep billing me. When I attempt to log onto their website, the response is that my password is wrong. When I try to change password their response is my email address is not in their system. When I try their chat feature the reply is that there is no one currently available. So far they've billed me two months for a service I can't use. Zero stars as far as I'm concerned, but your site requires at least a one star. I guess it’s ok, but I thought it would be much faster. Installed it a week ago and everything was ok until yesterday. It just died and can’t make it work. My subscription is still on, just got it as I said. Excellent provider, I’ve got no complaints about its performance, I just think premium plus plan is a bit too pricey. CyberGhost is like an adopted stray dog, it has its flaws, but it’s still adorable and loyal. And it’s affordable as well. I like its client, I like the speed, I like that you get ad-blocker and I love the kill switch since my internet is really moody. But I’d really like a chance to contact the support any time after 10 am and get a response, those working hours are killing me. I use the free plan. So far so good although I’m thinking of upgrading to get more benefits. The plans are cheap so I might as well. I had a hard time setting up protocols. The process should definitely be easier. Good speeds and a decent choice of servers! 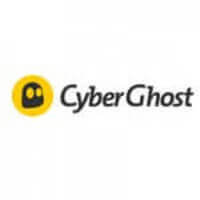 We found 1 verified CyberGhost discount for April, 2019. Save amazing 73% on this flash deal! Sign up and we’ll let you know about future CyberGhost promo codes. Discover the full range of possibilities CyberGhost offers and become an advanced user in no time with our beginner-friendly CyberGhost guides. Whether you are interested in secure torrenting, unblocking Netflix, setting up CyberGhost on all your devices or you simply want to learn more about CyberGhost, you can find verified information and clear instructions in our CyberGhost guides below. CyberGhost Price - which offers up-to-date information on CyberGhost prices, as well as valuable details about its free trial, satisfaction guarantee, and payment options.